NABCEP sets the standard for solar certifications in the United States and Canada. 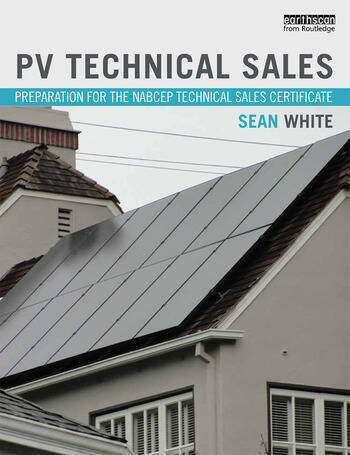 The NABCEP PV Technical Sales Certification shows customers, friends and employers that you are knowledgeable and qualified to sell solar systems. If someone is selling solar, they need to know what they are selling and how it is configured. Where will they connect the circuit breaker? Will the house need expensive modifications in order for a PV system to be installed? These are the questions that you as a NABCEP Technical Sales Certified solar salesperson will confidently answer. This book is full of practical information that anyone selling solar should know in order to properly serve their customers and to ethically represent the industry that is solving the world’s problems on the ground and rooftop level. This book will be of use to those taking the NABCEP PV Technical Sales Exam, as well as anyone selling or planning to sell solar. Sean White is an experienced teacher, instructor and solar PV professional. He received the 2014 Interstate Renewable Energy Council Clean Energy Trainer of the Year Award at Solar Power International. Sean teaches classes for many organizations around the world.